Part racer, part platformer, part puzzler, all fun. I want it just so I can play as Mr. Destructoid. And the game has looked awesome since the trailer debuted on XBL almost a year ago. And the banner on the pic says "Not-Review", because Destructoid isn't technically allowed to review the game, since they are a part of it. And this has just prompted me to find out that there is a Mr Driller game on Wii Ware which has made me happy. Interesting; it reminded me of Dig Dug, which given your take on it seems quite appropriate. 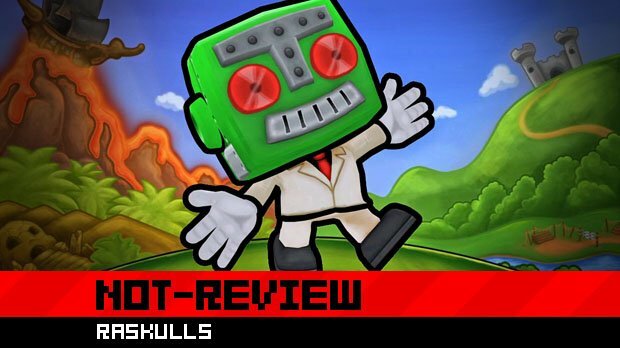 Yeah, I was wondering where the similarities to Mr. Driller would pop up in this review. But I guess it might be none because it does look like they're doing more with that mechanic. I kinda expected Susan Arendt to do this one for some reason. Looks like a nice game. XBLA is really Shining this past year. I picked up this game two weeks ago and have spent several hours playing it. The main story is quite funny and very diverse in its challenges. The times races are very difficult, having one mis-step you will lose. Overall very fun, and quite challenging game. I loaded it up on new years and had a good time with the 4-player multiplayer as well. Just looks like they copied the key component of Mr.Driller. I mean it looks cute and whatnot but I guess it will sell. The Raskull streams were awesome! Funny thing, I use Koala as my avatar, but I've yet to actually play Raskulls. I haven't bought anything from XBLA in a while, so the next thing I buy might as well be this. Besides, it's Australian, so it's automatically awesome. Unless it's not. In which case I'll probably buy it anyway. I was actually impressed by the demo, and considered buying it. But it just seems like it would be so short, and the last time I heard everyone say "it's short but you'll feel it's worth it at the end" (Limbo in this case), I was disappointed by it's very short length. And for the record, I even went back and did the 'beat the game only dying twice' achievement in Limbo, and I still felt it wasn't worth the $15 it cost. I'd really rather not go through that again. That said, it does seem like it'd be a very fun game. Its a platformer. Where you race. And solve puzzles. Simple. I believe this is the game that was featured in the Mana Bar as an exclusive beta since its opening, Yug was pimping it every chance he could on the AG podcast. And for shame Mr.Funk, for shame! How could you not know about a slightly obscure arcade puzzler ported on every handheld since the Game Boy Color! This looks exactly like Mr Driller on the DS! Oh come on, at least give them some credit for adding platforming elements and horizontal stages! Looks really fun and challenging.